With a sigh, a wipe of his hand across his nose and then a quick flick at the tears gathering at the corners of his eyes, Durban quadriplegic Mark Charlesworth dragged his left leg on to the 550th step at the top of the arch of the Moses Mabhida Stadium on Sunday. At that moment, the sounds of revving engines from the supercars parked below could be heard in salute as Charlesworth raised his arms into the air. His dream to conquer the arch while raising money for charity was accomplished. Charlesworth, who once raced Porsche cars and lost the use of his arms and legs in a horrific accident in 2004, didn’t believe that he wouldn’t walk again. 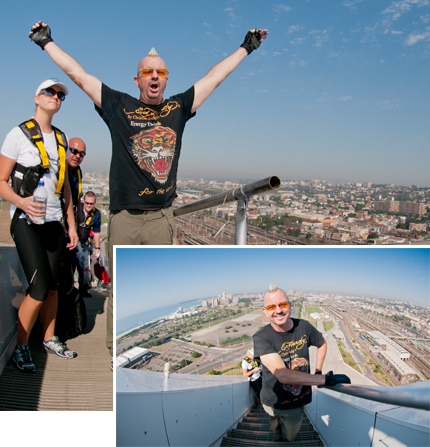 Once the Moses Mabhida Stadium was completed in 2009, he set himself the task of climbing the 550-step arch to raise funds for Hospice, the Quadpara Association, the Chris Burger fund and the Voluntary Emergency Medical Assistance unit.